Skeptophilia: The enemy of my enemy is... um... wait. In today's news from the Unintentional Irony Department, we have religious wingnut and young-earth creationist Ted Cruz calling the anti-GMO cadre "anti-science zealots." "People who decide that is what they want, they can pay for it already, but we shouldn’t let anti-science zealotry shutdown the ability to produce low-cost quality food for billions across the globe," Cruz said. "GMOs help to provide food for people across the globe and strengthen farms across the nation... The people who oppose GMOs and want to buy organic food can do that." 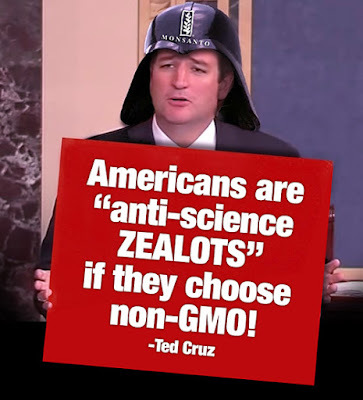 [Cruz] insults all those Americans who share ever rising concerns over food pesticides, herbicides and chemical contaminants that the scientific literature overwhelmingly proves can cause cancer. If only guns could provide personal protection against pesticides, then Ted Cruz might find himself on the right side of this argument... but that's not how chemistry works. Chemicals are insidious, slow, invisible killers that commit violence on a cellular basis, day after day, meal after meal, until the victim is rendered diseased and ultimately dead. The primary defense against chemical violence is CHEMICAL AVOIDANCE. Yup. That'll work. Avoid all chemicals. Presumably including water, oxygen, vitamins, proteins, DNA, and RNA. Because "that's how chemistry works." Perhaps even worse than the betrayal of fundamental constitutional principles of liberty, by going all-in for Monsanto, Ted Cruz joins forces with the most evil corporate entity on planet Earth. Because Ted Cruz claims to be a supporter of Christianity, Biblical principles and God's creation, his betrayal on GMOs is far more than a political betrayal; it is spiritual treason against God. Monsanto has taken a corn crop that was perfected through natural selective breeding by early humans, then turned it into a food POISON that damages the kidneys, liver and reproductive organs. This is a treasonous act against humanity, Mother Nature and even God. By supporting Monsanto, Ted Cuz[sic] is openly encouraging a devious corporate entity that systematically violates the laws of Mother Nature and believes that Man's engineered (poisonous) seeds are superior to God's seeds that gave rise to nutritious corn via natural selection (humans working in harmony with nature to gradually shape phenotype genetic expression of food crops). And the coup de grâce comes at the end, where Adams calls Monsanto "Monsatan" and says that by supporting GMOs, Cruz is "aligning himself with the devil." So we first have climate change and evolution denier Ted Cruz calling the anti-GMOers anti-science, and the vaccines-cause-autism, chemtrail-believing anti-GMOers countering that Cruz has sold his soul to the devil. Me, I'm wondering what I should think. My inclination is to let Adams and Cruz fight to the death, because either way, rationalism wins. But the whole thing reminds me again of the Senegalese saying I have quoted more than once: "There are forty different kinds of lunacy, but only one kind of common sense."